Aside from Facebook being a popularly used app on your phone, you’ve probably heard and seen a lot about Facebook on the local and national news this year. With all the scrutinizing and criticizing of data that Facebook has within its reach, they have also made countless updates throughout 2018. If you’re a fan of manually updating your apps, you’ll see Facebook is almost always on the list of apps ready to be updated. With 2018 coming to a close this month, here’s a recap of key events and updates Facebook launched from January to June 2018. Keep an eye out for next month’s article, Part 2 for July to December 2018 updates. Facebook changed what news users see on their News Feed. News that is rated as trustworthy by the Facebook community is now prioritized. This will help keep news informative and relevant to people’s community and interests. With this update you will never look at your News Feed the same way again. 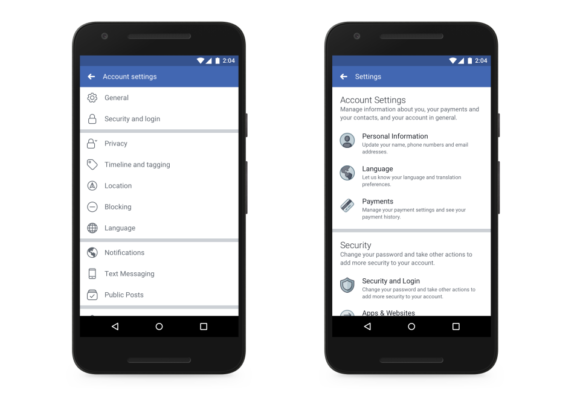 Facebook made an effort to help users easily navigate their Privacy Tools. They also released an educational video on how you can better manage your privacy. 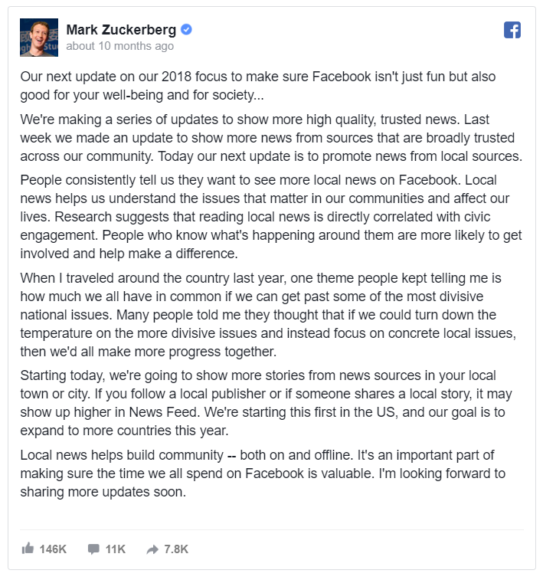 Facebook made a series of updates to target local news that is relevant to each user’s community. This change will allow local news publishers to appear higher in the News Feed by following the Publisher Guidelines. 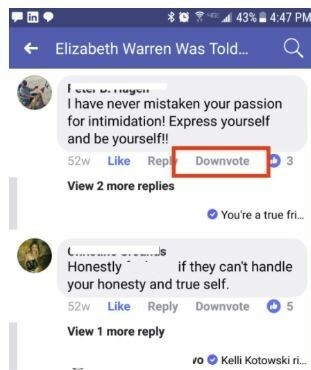 Facebook is reportedly testing the downvote option in comment sections. According to Facebook, the test is running for 5% of Android users in the U.S. with language set to English. The downvote button only appears on public Page posts, not on posts by Groups, public figures, or users. There’s currently no plan to expand the test as is. Community Help was an update initially added a year ago for people to give and ask for help during a crisis. Facebook is making an update by allowing businesses and organizations to post in Community Help for them to provide information and services for people to get the help they need in a crisis. Job seekers can now find jobs at facebook.com/jobs and the “Jobs” option in the “Explore” section on mobile, by clicking the Jobs icon in Marketplace, or visiting the Jobs tab of a business’ Page. For Businesses, they can now post jobs, making it easier to connect with potential applicants. In an online poll of 5,000 adults conducted by Morning Consult, one in four people in the US said they searched for or found a job using Facebook. Stats above sourced from Morning Consult. This explore feed test was a trial response to consistent feedback from people who said they want to see more from friends and family in their News Feeds. Facebook addressed it by creating two different views in News Feeds, one is dedicated posts from friends and family and the other one is posts from Pages and advertisers. The test received minimal satisfaction, and that’s why Facebook ended the test. Strategic Communication Laboratories (SCL) and their analytics firm, Cambridge Analytica became household names in regards to the potential Facebook user data breach. At this time, Facebook suspended their relationship with both organizations. Facebook announced that they are expanding the update globally. Users all around the world will see more news from local sources within their community that may be relevant to them. Facebook continues their effort to make their privacy tools more user-friendly. They redesigned their settings menu to make all privacy settings easily accessible from one place. In order to prevent another Russian ads incident, the Facebook team is cracking down on who is authorized to create political or issues ads, even going as far as to include strict identity checks with social security numbers and mailing address verification. You can now get rewarded for reporting misuse of data to app developers. Some rewards were close to $40,000 for high impact bugs that were reported. Facebook Fundraisers are a great way to let your friends know about a cause that is important to you. 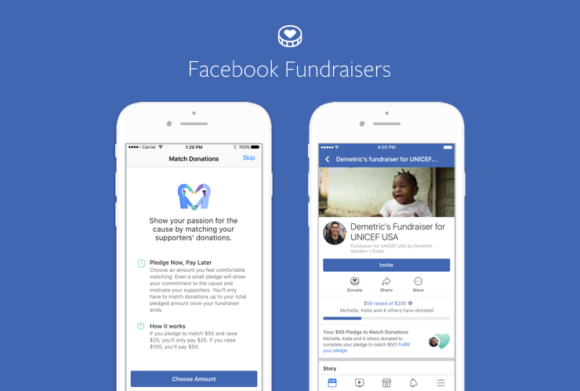 Here are a few new things they added in this update: people can match donations to a non-profit organization. They also added new categories including family, faith, travel, and volunteering, and removed the platform fee. Previously, users could only report messages through the Facebook reporting tools or the Messenger Web App. You can now access reporting right from the conversation on iOS or Android. Additional details and exact steps are in the link above. With home services being the most popular recommendation request on Facebook, it makes sense to jump on this opportunity to give users what they are asking about. Facebook is working with industry leaders to provide an “all-in-one” solution for your home projects. Groups can be tough to manage, and Facebook is making it easier for admins with these new updates like admin support, online resources, new features for group rules, and adding pre-approved members. Over time, this feature seemed to be used less and less with each year since its launch in 2014. This was removed to make room for new features like Breaking News and News Video in Watch. Have you ever seen an ad and re-read it or watched it again and still didn’t get what the advertisement was? Now you can leave feedback for advertisers that go directly to the businesses. This helps hold advertisers accountable for the deals and offers they are promoting. Want to avoid learning about the end of a series or sick of hearing about particular pieces of news? 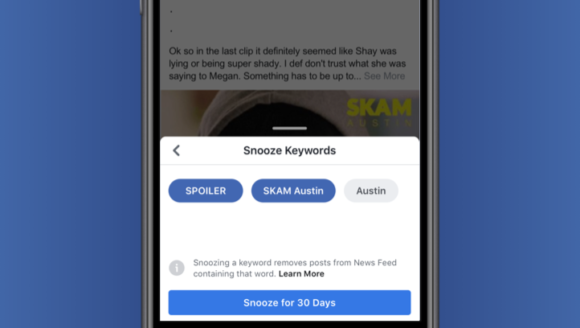 Just snooze those keywords to avoid them showing up in your News Feed. With a combination of technology and human review, removing fake accounts, and fact-checking partners, Facebook has continued its efforts to fight false news from being spread around the platform. This includes expanding to new countries, checking photos and videos, and taking action against repeat offenders. Curious how all these updates and changes might have affected your business’ presence or advertising? Reach out to our marketing team to learn more about how to stay on the cutting edge of Facebook and other social platforms’ changes. You can call us at 248-687-7888 or email us at inquiry@mediag.com, or hey drop us a message through Facebook!